This is my 1947 14 foot Thompson fishing boat that I rebuilt a few years ago. It needed an outside stem and a couple of the short ribs. Since my newer Evinrude motor got stolen, I am now running a 1955 Evinrude 15hp "Whisper Quiet" twin. I got the boat from the owner of Birch Point lodge and resort on Lake Vermilion, in northern Minnesota about 10 years ago. He was going to burn the boat, as it had outlived its usefulness to him. I took it off his hands. I striped the boat inside and out, replaced the outside stem, a few ribs and replaced the seats with new, wide cedar boards and replaced the center deck board that hides the deck seam. I dug out the garboard seams and repacked them with epoxy and then epoxy coated the hull on the outside up to the gunwales. 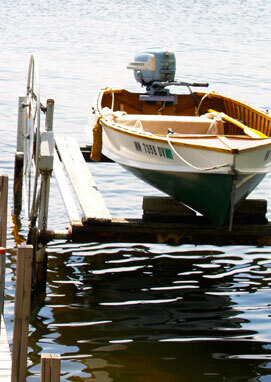 The boat is a joy to use on the northern lakes. It is quiet, handles well and is warm on the feet, even though the water is cold. There is nothing like wooden boats. I am quite proud of this little boat.